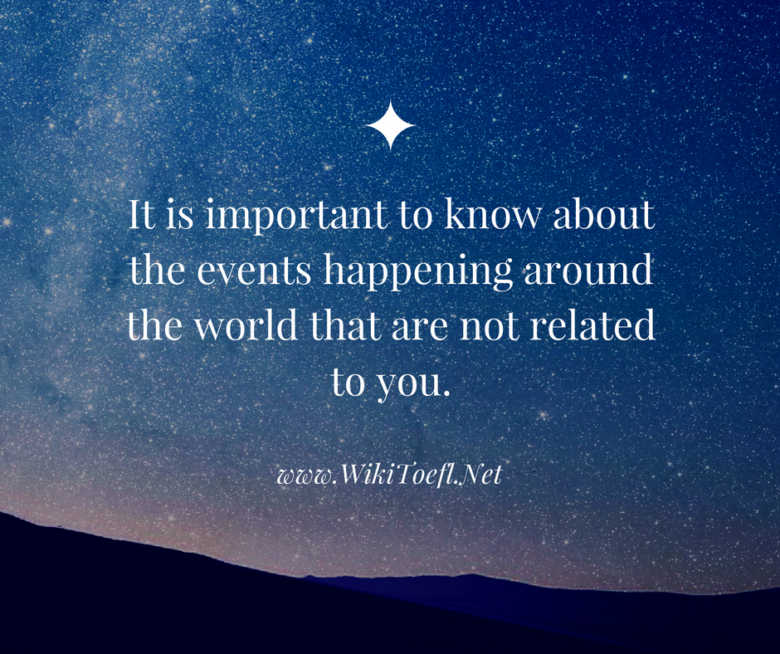 It is important to know about the events happening around the world that are not related to you. My parents catch the evening news every night. They want to know what is going on in the world. I do not understand the point. After all, there is no need to care about events in the world if they have no effect on me. For one thing, I think locally, and so do many others. I have not and never will travel much outside of my hometown. This is true for many of the world’s people. A large majority of people never venture over 100 miles from their birthplace. Therefore, they only need to consider local news and its effect on them. My friend’s mother is a good example. She has only left her hometown for short trips with her family. She has no interest in ever going abroad and only cares about what is happening in her neighborhood. People like her, of whom there are many, have no need or no interest to learn about world events. Another thing to remember is that no matter how important world events may seem, they have little importance on one’s life. There have been no dramatic changes in my country since I can remember. Even though we just changed presidents, life goes on the same as always. And various world events have done nothing to change my life or that of my family. Therefore, I see no need to learn about these outside events. I have too much going on in my life to be bothered with learning about facts or news that will never concern me. It really is not important to be aware of events going on around the world. Most people are more focused on local events. And, despite seeming important, global events do not have much effect on people’s lives. While current events are interesting, there is no need for people to be overly concerned about them.